Global Warming, pollution and climate change, these are hot buzzwords and to most an undisputed fact. Ever heard of this buzzword: 'anthropocene'? What does it refer to you may wonder? Anthropo - from the ancient Greek anthropos means“human”. Cene - from kainos means “new” or “recent”, and it started with the industrial revolution of our society. Put the two together and you've coined a word for an atmosphere and environment that we homo spaiens have played about with and altered. Cynthia Schwertsik an artist of Austrian heritage who now lives in the Adelaide Hills took on presenting this concept in a different light : giving it some colour and form. look like beautiful explorations with paint on canvas in colour and form. Actually.... they are garbage and Cynthia tells us that they depict the Anthropocene. Cynthia's photo series called 'Poly Ubiquitous' ( 'poly'- a prefix meaning many, and 'ubiquitous': seeming to have the ability to be everywhere at once) has used garbage as a starting point. Cynthia collected waste and took a look at it through her camera lens. PET bottles, takeaway containers and plastic bags and all the plastics that make our life so easy were her ingredients. Looking for inspiration for painting, she created three dimensional lumps, but feeling unsatisfied with her results, she stacked the plastic objects against a window, and then discovered the potential of composing colours and shapes with the use of backlight. Then she recorded the performance of piling trash and arranging bags on video. As she started working with this plastic waste, her perception shifted between disgust and fascination. She decided to treat plastic as the landscape that we live in and turn it into an object of beauty. Cynthia's artist friends told her about a project going on in Sydney. It aimed to beautify the city centre and conceal much of the construction work at building sites around Sydney by surroundingit with artwork., Cynthia submitted her Poly Ubiquitous Anthropocene images. Hundreds of artists entered and Cynthia was selected as one of the winners - quite an honour and lucrative too. In the below image you can see her artwork covereing up an ugly buliding site in Sydney's CBD - stunning isn't it. Cynthia comments: “I want this artwork to bring awareness to the next piece of plastic we hold in our hand before it becomes garbage,” At first glance, the brightly coloured images appear abstract – only upon second look does the subject matter make itself known – plastic shopping bags adrift in the sea. The resultant images of Cynthia’s work have also been scaled to domestic sized projections and prints on paper. Her artwork is haptic and sensual, and definitley not what comes to mind when you think of landfill. She moves from waste to wonder. She lives in a pituresque home with magnificent gardens (her partner is a landscape architiect) in the Adelaide Hills with her partner and son. She has a diverse practice spanning painting, drawing, sculpture, performance and photography. Her artwork graces the walls of galleries in Johannesburg, Vienna and Berlin, and she has previously been artist in residence at Cleland Wildlife Park. Like what you see? Well... you can learn some of Cynthia’s techniques too. Cynthia holds regular art classes at our gallery and shares skills. Students learn about technique, colour, texture and balance. how to use what they are most attracted as a basis for their artwork. These classes support you in to exploring and expressing your creativity all that in a fun and playful environment. As Adelaide’s premier art consultants, Art Logic has an extensive collection of over 1500 pieces of amazing artwork from exciting and experienced artists such as Cynthia available for purchase and for rent. 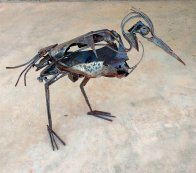 Our artwork ranges from acrylics,oils and watercolours to sculptures in bronze, aluminium and stainless steel, unique kiln formed glass pieces and digital prints. Contemporary and modern, we are sure to be able to find the perfect piece to suit your need, whether it is something created from a pile of old junk such as Cynthia’s masterpieces, or the most detailed and intricate paintings or drawings. Have issues of the environment always permeated your work, or is this a relatively new area for you? I’ve thought about environmental issues for a long time, but have not always incorporated these ideas into my art in a direct way. At the centre of my work is always the awareness of the physical interaction with the world. I investigate everyday routines that cast a shadow on life when these activities become almost unconscious. Why has plastic use gripped you in particular? How do you bring this ethic into your daily life? As I started working with plastic waste, my perception shifted between disgust and fascination. I decided to treat plastic as the landscape that I live in. I was interested in the scientific discussion of the Anthropocene: as today being an age where the human impact is inscribed into the earth’s sediment – one of the components of this is plastic compacted into a layer of the earth. Two artists : Louise Paramor and Roman Signer have heightened Cynthia's awareness of thing-power and animism through their work. Signer inanimates objects as if they had human properties to participate and experiences events. Wanting to examine the living space that she claims for herself in relation to the waste she produces, Cynthia perceives that landfill implements the idea that we can get rid of our rubbish by hiding it under the carpet. Her art practice started in the field of painting but subsequently included performance and the digital image. With these techniques, she focuses on visual explorations in various manifestations of everyday usage plastics. Cynthia considered the works of both Jane Bennett who invents the term "material recalcitrance", a phrase to describe the resistance in materiality to replicate ideas, and Gay Hawkins and Emily Potter, authors of Waste Matter, Potatoes, Thing-Power and Biosociality, who remark: there is a tension between the utopia of living in a world where there is no waste and dystopia of imagining the world drowning in obsolete "affluenza". Potter and Hawkins identify the underlying problem, which is the activity of the junk that is not considered. Bennetts particular focus is on urban waste and the potential of rejected matter to invade the carefully contained sanctuary of domestic comfort. What we wash down the drain in privacy and stuff into the bin to become invisible could suddenly be publically reappearing. Bennett and Hawkins have developed the thesis of a force that is in things, otherwise called “thing-power”. As an artist, the stubbornness and resistance of materials reflects the constant struggle in the studio. Here Cynthia converted thoughts into matter and made them operate in the physical world. Garbage does not necessarily stay put, it blows away, or may start to smell, among other occurrences. Curiosity and the intention to raise her awareness of the choices she makes in her daily life, were driving forces throughout this project. Tim Inglot, in Being Alive describes the human experience of being in the world, as being wrapped in material soup. Her project started with the notion that this soup is growing thicker. The word landfill produces a vision in front of her inner eye: the bulk of all the plastic she had ever used washing up on Adelaide beaches. She pretended that garbage truck drivers were on strike for a month, and then assembled the resultant collection of plastics by origin and date and put under pressure to form clusters. This procedure imitates the future integration of plastic into the sediment of the earth. Cynthia's work activates the plastic residue that builds up between shopping and eating and creates a view through the kitchen window into an anthropocentric world. A world we now have to share with the matter which we have invented for convenience, the plastics that do not decay. She wanted to highlight human dimension of denial, the way we can distort the real for what we want to see. In this jumble, she found the visual language she had been searching for. The close up through the camera revealed a sense of landscape. To use a window as the platform for her work was initially an aesthetic decision, but the implied critic on environmental issues was ever present. The daylight transformed the garbage to a magically coloured set. Her scenic view was obscured, replaced by an accumulation of junk. She watched the manifestation of the thick soup of materials through the camera lens, and as the window slowly filled with plastics she saw the beauty. The fragments became colourful abstractions, records of the stacked plastic mess. The next step, to eliminate the background scenery was influenced by Roman Signer's performative installations, upsetting the familiar through the medium of surprise. For many years Roman Signer's explosive art has been an inspiration: he can turn accidents into art. The viewer is stunned with a great sense of humour. There was something to learn from Signer's use of familiar objects and situations of the everyday commodity. The artist, as the human factor is included as just one element in the chain reaction. Cynthia’s use of material is borrowed from Paramor’s dialogue of reclaiming the waste and modelling perfect representations of the contemporary world. Recycling the found plastic objects into amazing artwork forces us to look at our junk with new eyes. She decided though that she didn’t want to clean it up, recycle of prettify it, the plastic is what it is. The aim was not for the plastic to have an experience, the idea was to find a way to turn her collections of waste material into paintings, to change discarded junk into objects of interaction and find a way to create art without enlarging her environmental footprint. Her intention was to find a visual language that would allow the denied and discarded artefacts to be accepted into the living room. She wanted her art to speak about the Anthropocene from the inside of our first world comfort and cast a view on our daily contribution to landfill.